I was having a conversation the other day about the various merits of a longer surfboard. As I’ve discussed before, a bigger board with more volume will always paddle a bit quicker, but this got me wondering if the length of a surfboard might affect the paddle speed as well. There is a well known theory in Naval Architecture that ties together the length of a boat and the top speed it can make. This is generally known as “Hull Speed” and relates particularly to boats pushing water aside in “displacement mode”, like a surfboard would be when being paddled. As far as I can find, no one has applied this theory to a surfboard, but luckily it’s a pretty simple equation. The textbooks all talk about using the “Waterline Length” of a hull, which on a surfboard is simply the entire length of the board in feet. You then take the Square Root of that length, and multiply the result by 1.34. This then gives you the theoretical maximum speed of your boat in Knots. Just as a little experiment, I applied this to a 6ft shortboard and a 9ft longboard, and the results are pretty interesting. 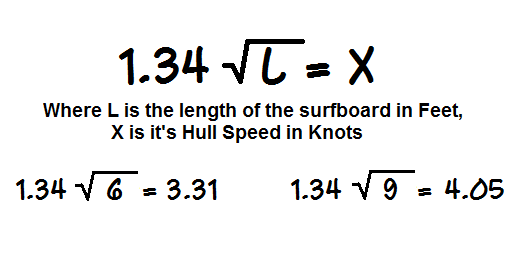 The shortboard would have a maximum hull speed of 3.31 kts which is 3.8 mph or 6.1 kph, while the longboard would have a hull speed of 4.05 kts (4.7 mph, 7.5 kph). So firstly, it’s interesting to see that those speeds are well within the reach of the average paddler, so there’s a good chance that these hull speeds may actually limit a surfer’s top paddle speed. The second interesting point is that the longboard can give you a potential 1.5 kph boost in speed. That’s an extra meter every 2 seconds! Now it’s worth mentioning at this point that, firstly, these Hull Speeds will only limit you if you’re a good enough paddler to reach them. Secondly, a surfboard can and will break free of this speed limitation, by climbing out of the water and planing across the surface. However, in order to do this, it requires more power than your arms can generate, and so only happens when you catch a wave. Finally, this Hull Speed equation is the most basic of several that emerged from William Froude’s experiments in the 1860’s, and a proper Naval Architect would probably find a few holes in my application of this theory. So this is just a starting point for looking a little more carefully at the physics behind our surfboards, and researching this has made me want to find out more about how and when a board is going to jump up and start planing. Nice article. You need to take surface friction into account as well. Hey Max, That’s true, although from what I could find, in a small craft like a surfboard, the wave making resistance accounts for most of the drag, while on a big ship the surface friction is the primary contributor. I think surface friction will probably come into play for the next article on planing speeds. Thank you that’s a question I’ve thought about for a long time without really finding out why and what. 8ft 2″ mini Mal which is a great fun board, turns quite well , is set up as a Thruster and is 22″ x 3″. 71 y.o. so the float. really helps. Those Hull Speeds re flying down a moderate sized face…..say under 2 metres..(I’m on East Coast of Oz .Sunshine Coast Queensland, lots of slop except in cyclones)…. Could you calculate those speeds for me in in kph ? Maths definately not my gig. Nice article Harry, I also would said that in a short board the Waterline length is increased by your legs. I think that is probably correct. You can also lengthen the waterline with your arms when you paddle. Rob Case talks about this in quite a few of his videos on paddling technique.